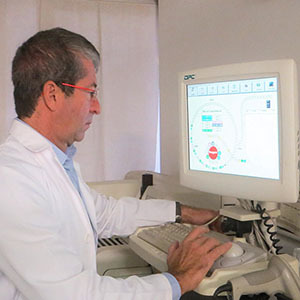 Even before the degree, in 1982, he started to acquire and develop his skills in ultrasound diagnosis, in that era still a newborn technique, but that soon would quickly and completely revolutioned the clinical approach to thyroid disease. He specialized then in Endocrinology at the University of Florence in 1985 with honors, after that continues its ultrasound training through courses and workshops in various italian universities. Of those years were his first experiences of thyroid cytology supported by the already acquired skills in diagnostic echo -guided procedures. He followed later another two postgraduate degrees, first in Radiology and later in Urology who complete the formation of a complete professional profile focused on the areas of Thyroidology and Clinical Andrology through a multidisciplinary clinical approach. In the years of training he authored numerous scientific publications mostly related to the endocrine and andrological ultrasound diagnosis. Since 1988 he has collected, in over twenty-five years of activity, a huge personal series of clinical and ultrasound thyroid diagnosis, that is now nearly 100,000 cases and is recognized as one of the largest nationwide. Despite his professional skills are unanimously appreciated, he is always more than pleased to see that one of the basic reasons for his professional success still remains the interpersonal skills that patients affectionately recognize to him.